Everyone had been calling for a stand-alone rep weekend for years (and ideally stand-alone Origin but that's never going to happen) but it has only taken two years of the weekend to be in place before NRL clubs have begun to use it to their advantage. With no NRL action this coming weekend, a few clubs are taking this opportunity of basically a two week break between matches to rest up key players and thus - they have withdrawn the likes of Mitchell Pearce, Robbie Farah, Aaron Woods, Jarryd Hayne and Sonny Bill Williams from contention for various rep sides this weekend. But note the lack of Australian players on this list - proving maybe that the mid-year Test does carry a lot of weight that most end of year Tests do not. This is a great sign for Australian Rugby League because they are not the current World Cup holders and getting things right in this Test helps them set up for a genuine assault on reclaiming the trophy at the end of the year. Votes from Round 6 are below. I do however understand why clubs would encourage their star players to take a couple of weeks off, especially if those same star players are going to play State of Origin in a month or two. But Sonny Bill Williams won't be playing Origin... so really it is his withdrawal that is the most disappointing. Understandable yes, but still disappointing. His knee might be sore but it's hard to believe he wouldn't be playing this weekend if the Roosters were. To the teams for Friday's Test in Canberra - kick-off at 8pm. Billy Slater, Darius Boyd, Greg Inglis, Justin Hodges, Brett Morris, Johnathan Thurston, Cooper Cronk, Matthew Scott, Cameron Smith, James Tamou, Greg Bird, Sam Thaiday, Paul Gallen. Bench: Kurt Gidley, Luke Lewis, Nate Myles, Anthony Watmough, Josh Morris. Coach: Tim Sheens. Josh Hoffman, Sam Perrett, Shaun Kenny-Dowall, Dean Whare, Jason Nightingale, Kieran Foran, Shaun Johnson, Jesse Bromwich, Issac Luke, Jared Waerea-Hargreaves, Frank Pritchard, Kevin Proctor, Simon Mannering. Bench: Elijah Taylor, Sam McKendry, Ben Matulino, Alex Glenn, Tohu Harris, Roger Tuivasa-Sheck. Coach: Stephen Kearney. Jeremy Smith is likely to be suspended, faces 4-6 weeks for a head slam in Round 6 - and withdrew. Quick Tip: Australia are about 12 point favourites... which might be unders given the form of their key players after six rounds of the NRL. If SBW was playing for NZ I reckon he's worth a try to them, but no more. Do you think clubs are being smart or disrespectful to the rep weekend? Round 6 - Six points that emerged from a four day footy week. FIRST TACKLE - Jamie Soward is fortunate Robbie Farah is a better man. I don't really want to repeat what was said by Soward at the SCG to Farah on the field but I will report he did apologise and you should just read the rest of Glenn Jackson's story and make up your own mind. If you want to know why City v Country has a place on the Rugby League schedule - ask the people from the NSW Country town that hosts it every year and you'll know why. A couple of years ago I spoke with the publican of an Albury hotel in the week leading up to the match and he could not speak any higher of the impact that simply knowing the game would be played in Albury had on the town and its surrounds. Those who talk of scrapping it every year have no idea of what football means outside of their Sydney-centric minds - and I sincerely hope it remains on the schedule for many many many years to come. Having said that - the two week break that NRL clubs will take advantage of where they can - means that there are a host of stars not playing in this clash... but that is OKAY. Give the youngsters a run, or the journeyman who has never played rep foot before... and maybe even Reece Robinson. Oh wait - he missed out, and best as anyone can tell that's simply because no one in the City camp knew he was eligible... otherwise how can you explain him missing out to Joel Reddy and James Tedesco when Jarryd Hayne and Chris Lawrence withdrew. Update: The NSWRL was kind enough to explain Robinson was deemed injured when they asked the Raiders if he could replace Hayne. Casualties from named teams: Jarryd Hayne, Chris Lawrence, Aaron Woods, Robbie Farah, Josh Reynolds (CITY), None (COUNTRY). CITY: Nathan Merritt, James Tedesco, Michael Jennings, Joel Reddy, Jorge Taufau, Wade Graham, Adam Reynolds, Andrew Fifita, Nathan Peats, Tim Mannah, Ryan Hoffman, Trent Williams, Feleti Mateo. Bench: Tom Symonds, Tim Grant, Adam Cuthbertson, Curtis Sironen, Jamie Buhrer. Coach: Brad Fittler. COUNTRY: Michael Gordon, Akuila Uate, Jamal Idris, Jack Wighton, James McManus, James Maloney, Josh McCrone, Willie Mason, Michael Ennis, Aiden Tolman, Josh Jackson, Boyd Cordner, Trent Merrin. Bench: Sam Williams, Tariq Sims, Ryan James, Alex McKinnon, Beau Ryan. Coach: Trent Barrett. The game is played on Sunday afternoon at 3pm at BCU International Stadium in Coffs Harbour. THIRD TACKLE - Can the Bulldogs find their way out of a 1-5 start? They've had a tough opening - Cowboys, Eels, Storm, Rabbitohs, Sea Eagles and Roosters... but they've still only won one game... against the bunnies of that group - the Eels. Minor Premiers last year and current Wooden Spooners, Des Hasler has a job ahead of him. 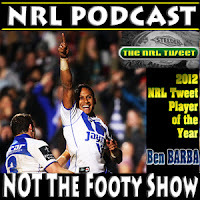 But the thing that strikes you about how the Dogs are playing is how they are trying to play exactly like last year in attack... that is the forwards roll off Michael Ennis for a tackle or two, then those same forwards take the ball to the line and sweep it out the back to Josh Reynolds or Ben Barba. Thing is - that style works with Sam Kasiano and James Graham in the team, right now Greg Eastwood is the only forward who can really execute that skill .. Aiden Tolman, Martin Taupau, Dale Finucane, David Klemmer and Tim Browne are go-forward men, they don't have that skill - yet the game plan seems to be asking them to be Kasiano/Graham while they are absent. Factor in a very rusty Barba and a slightly overwhelmed with the weight of being the lone playmaker on the team in Josh Reynolds (with Barba out) and it is any wonder the bulldogs haven't scored more than 20 points in six games? It's has to be a worry for Hasler, because if his strike weapons don't get ball with decent room to move - the Dogs look about as useful in attack as they did last Friday night when scored zero points. After the Rep Weekend - the Dogs have the Sharks in Gosford, the injury riddled Tigers at home, the very average Warriors in Wellington and then get the Knights in Newcastle. In today's NRL you can make the finals with just two decent months of football... for the Bulldogs one of those decent months has to start on April 28 or at absolute worst - May 3. Does Hasler need to re-invent the wheel to get the Dogs back in the running? "Get those referees in here to talk about their b____ errors," Ricky Stuart at his Round 6 media conference after the Eels had just blown a big lead on the Gold Coast. "I suppose Mitch (Pearce) is making me look a bit better than what I am," James Maloney is playing so well right now he's confused. Rest assured - Maloney's the main reason Pearce is playing better - not the other way around. He's quite rightly in the running for a NSW jumper. "I know I am just getting old and cranky. But I just think it takes the football out of footballers," Phil Gould is so ridiculously right about how teams ignore playing football to 'play their shape' in the attacking zone that it is depressing... read exactly what he is talking about here. "I probably shouldn't have played, but I was pretty desperate to keep our momentum going," David Shillington explaining that he played with a bad rib injury against the Warriors... the kind of commitment that a few players (are rightly or wrongly) not showing towards Rep Weekend. But it was costly for Shillington - he misses a Test jumper and probably a month of footy. "It's tough to get your head around using different balls for one week," the Jamie Soward quote we can publish from the SCG... and giggle at just a little bit. While the Rep Weekend has allowed clubs to rest players (which wasn't the reason it was brought in), a number of NRL players and NYC stars will be running around on Saturday in another Test Match and the NYC Origin clash. 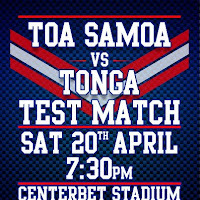 Penrith have got behind the junior fixture and hosted the first one last year, now they have added a Samoa v Tonga Test match featuring a good assortment of talent from the NRL. Given this is a World Cup year - players are being forced to choose which team they really want to be a part of (or know they will get picked for) and by the look of the two teams - it should be an entertaining Test. Plus it's cheap: $15 for adults, $10 for concessions and $5 for kids. Here is our best guess at the starting lineups from the named squads for the 7:45pm game. SAMOA (Actual 19): M Wright, K Fai-Fai Loa, A Winterstein, J Sa'u, D Vidot, C Tuimavave, B Roberts, J Lima, M Iosefa, R Asotasi, E Pettybourne, S Tagataese, L Tasi. Bench: L Ah Mau, M Taupau, M Taufua, A Elisala, T Pasene, L Saofaiga. Coach: Steve Price. TONGA (Actual 21): G Fisiiahi, M Oldfield, M Fonua, S Likiliki, E Uaisele, S Langi, D Foster, B Kite, P Politoni, S Moa, S Manu, J Taumalolo, A Tupou. Bench: N Seluini, FF MoiMoi, R Fa'aoso, B Murdoch-Masila, D Hala, S Havili, S Havea, A Vea. Coach: Charles Tonga. The NYC Origin teams can be found here - because finding anything current on the Holden Cup on NRL.com is a near impossibility. CHANGEOVER - Haven't seen Ricky Stuart's Press Conference? SMH reporter Phil Lutton has kindly transcribed it all for you here. "There were probably seven penalties there and probably more that we could have been penalised for," Stuart admitted. "I'm not blowing up about that. But there's now way they were that clean." That's the clincher for mine and why in some ways I don't think what Stuart said was really that bad. His beef is that if the Eels are repeat offenders every week - why aren't his opposition? Which really - is a fair point. Albeit a point that'll cost him $10,000 and may be skimmed over in the final wash-up from the 7 minute presser. This is how the votes were handed out for Round 6. 8 - B Hannant, 4 - J Hoffman, 2 - J Reed. 8 - J Maloney, 4 - SB Williams, 1 - J Waerea-Hargreaves M Pearce. 8 - J McManus, 2 - J Mullen K Gidley T Grant. 8 - C Cronk, 3 - A Reynolds, 2 - G Widdop, 1 - C Smith. 5 - T Learoyd-Lahrs, 4 - S Fensom, 2 - T Campese E Lee, 1 - J Croker. 8 - J Horo, 3 - D Cherry-Evans, 2 - N Stapleton, 1 - A Tupou. 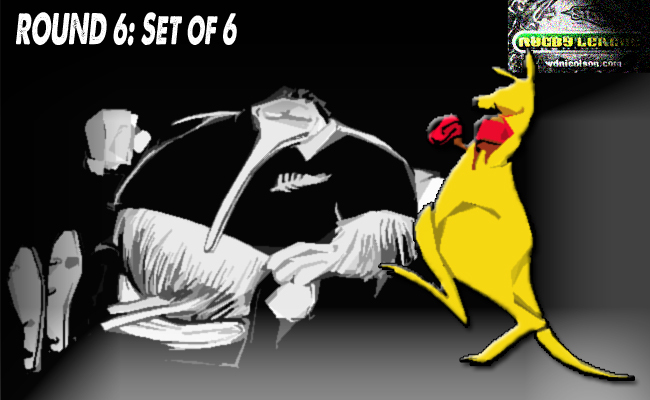 5 - R Farah, 4 - T Merrin A Woods, 1 - D Vidot. 6 - N Myles A Kelly, 1 - T Mannah J Hayne.